Indoor Portraiture Workshop for Digital and Film Photographers. Do you have a desire to improve your indoor portrait skills? This all-encompassing workshop will strengthen your portrait skills at shooting indoor with natural light, flash, and reflectors. Learn how to turn any room into a studio. You will learn valuable skills and techniques taught by one of Knoxville's most sought after portrait photographers! 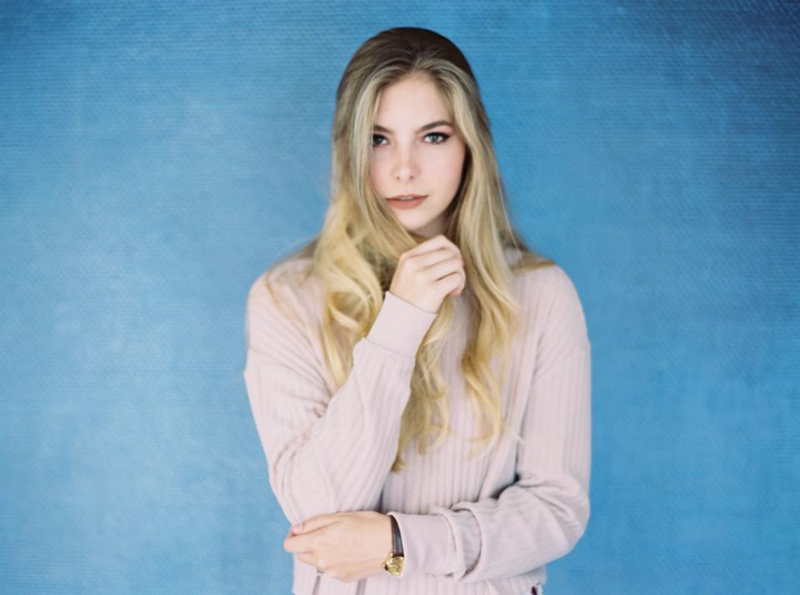 You'll work with Abigail at Indigo Corner Studio, (Located one building over from The Knoxville Community Darkroom) posing and working with your subject in studio. She will demonstrate using window light and fill flash in tight spaces to accomplish portraits at most any indoor location. You will be taken through all of the steps of a portrait session with Abigail and a model (professional hair and makeup provided by Claudia Nicole Hair and Stunning by Rachel). Learn with her one-on-one in this exclusive workshop! If you are a digital photographer this is a great opportunity to learn a little about film and even shoot a roll or two! If you use film during the workshop, Abby will be available the following Monday night at the darkroom to help you learn how to use darkroom chemistry and development techniques to bring your images to life! Watch Abigail in the darkroom as she shows her workflow and teaches you how to make contact sheets, select your best images and make real B&W prints! Workshop space is limited! Hurry, this workshop will fill up fast! Must have an SLR camera able to manually set aperture and shutter. 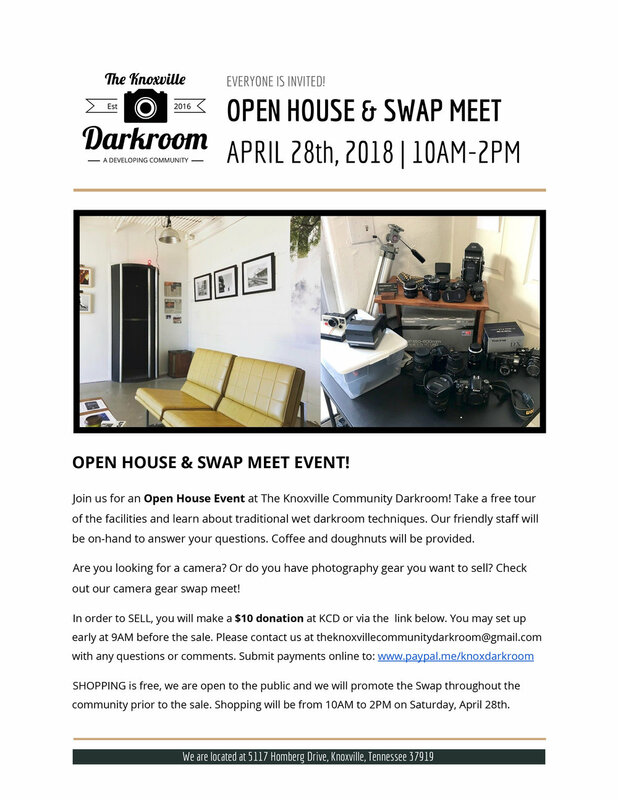 Workshop cost is $175 for Knoxville Community Darkroom & A1 Lab Arts members, $200 for non-members. I Got a Camera For Christmas: Now What? Did you get a new camera for Christmas? Do you need some help figuring out all the buttons, dials, controls and settings? Many first time photographers have the same questions! What are all those settings for anyway? Do you need a computer? Or for film photographers, once they take the pictures, how do they develop them? 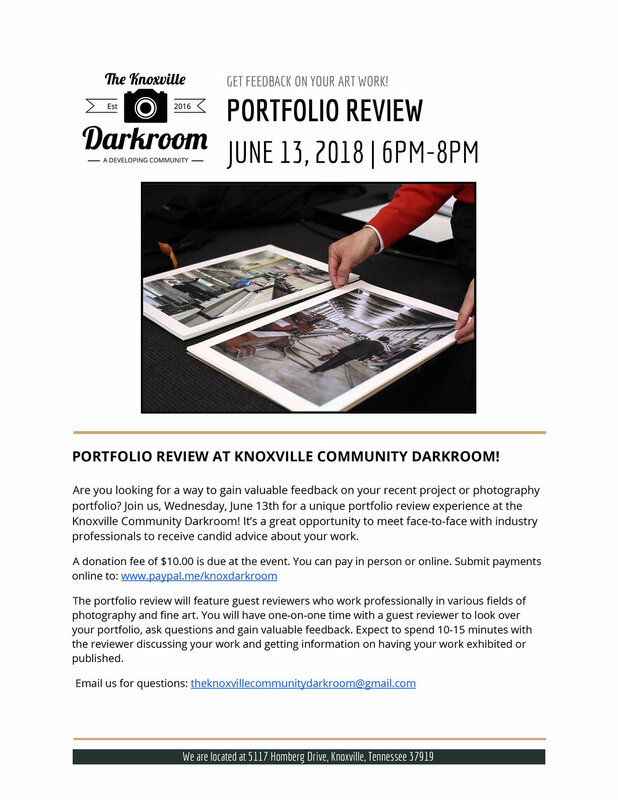 Let The Knoxville Community Darkroom make it easy for you! Our Introduction To Photography Basics Class is perfect for first time photographers, or those wanting to learn how to get the most out of their new camera. You don't have to be nervous about taking your camera on a vacation or capturing a family event and wondering if you have the correct settings. The class instructor will work with you, to make sure all your questions are answered and ensure that you feel confident using your gear. Don't let owning a new camera cause you to panic, learn how to make the most out of your camera and get tips on making meaningful photos that you will cherish for years to come. This class is perfect for building your confidence in using your camera and creating photographs you will be proud to display. Digital and Film cameras are welcome at this event! Photographer Lance King will be the class instructor. Cost is $50 per person. Sign up for the event securely via Paypal. 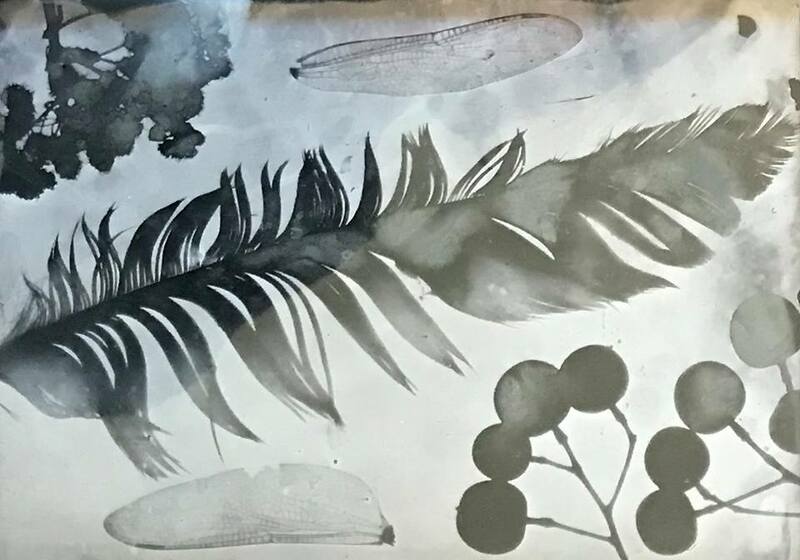 In this workshop participants will learn the process of 19th century wet plate collodion through photograms, camera-less images made by placing objects on photo-sensitized material. This workshop is for those new to the wet plate process. Students will be working with wet plate, tintype, photograms. Topics covered will include setting up a wet plate darkroom, pouring Collodion, sensitizing the plate, processing wet plate images, finishing plates, and scanning finished plates. All materials will be provided. Participants can take home their individual pieces at the close the course. Class fee is $150 for the day, and includes all course materials. Lunch will be on your own. 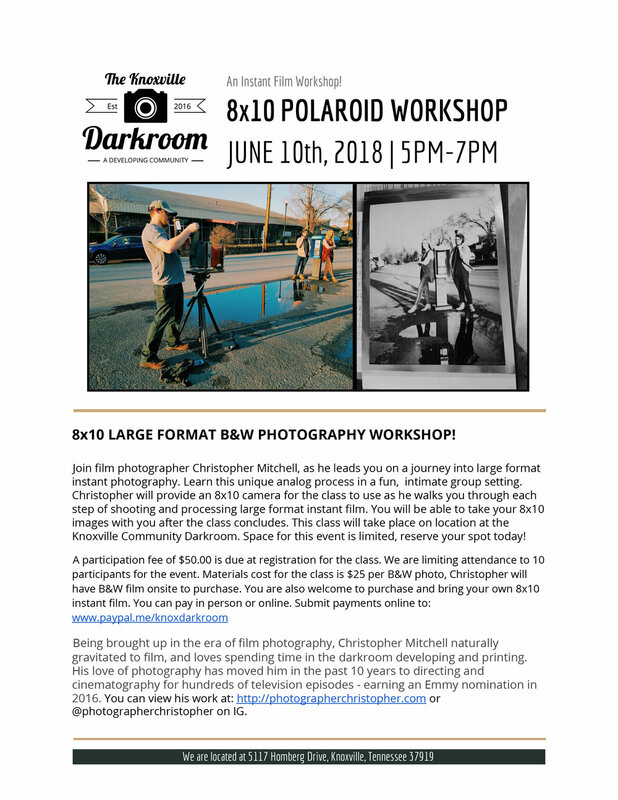 This workshop is held at The Knoxville Community Darkroom at 5117 Homberg Drive. A portion of your class fee will benefit KCD. Come support The Big Camera and learn a new (old) process! To sign up, please email info@bigcamera.org - space is limited in this workshop to provide plenty of one-on-one instruction, so sign up fast! This class is the first in a three part series, we are offering the classes as a series or individually for purchase. This is the first class: The Camera. The Camera will teach you all about analog shooting. Topics covered will be: selecting a camera, camera functions, operating in that mysterious "Manual" mode, metering your subject, lens selection and more. Pricing for this individual class is $50, or If you want to purchase the full series (3 classes) at a discount it is $100 for all 3 classes. Please include a note at the time of purchase that you are buying all 3 classes! KCD has a limited amount of 35mm cameras we can loan to users for this class series. They are free to borrow, but will only be issued on a first come / first served basis. Please use the secure Paypal link to reserve your spot today! This class is the Second in a three part series, we are offering the classes as a series or individually for purchase. This is the second class: The Negative. The Negative will take you inside The Darkroom where you will learn to load and process your film. For this class, you must have a roll of 35 or 120 B&W film shot in advance. We suggest buying film locally from F32 near West Town Mall or Thompson Photo. This class is the Third in a three part series, we are offering the classes as a series or individually for purchase. This is the third class: The Print. The Print will take you inside The Darkroom where you will learn the basics of enlarger use, burning and dodging and developing finished prints. For this class, you must bring your developed film and B&W photo paper. We suggest buying paper locally from F32 near West Town Mall or Thompson Photo. 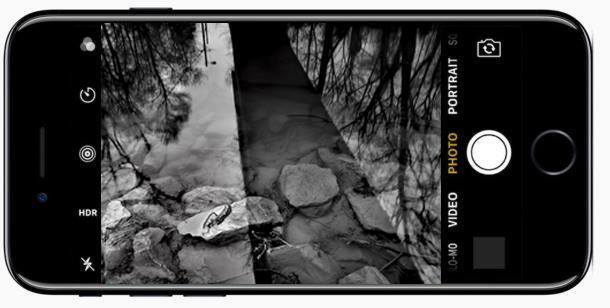 This comprehensive workshop will give you an overview of mobile photography, including tips to get professional images from your mobile device. Learn how to use apps, lighting, composition and camera angle to capture memorable photos of your personal world. You will gain a better understanding of how to use your mobile device to become a contributor to the thriving online photography scene. Learn the secrets to sharing images on social media as well as developing your workflow for archiving your photos and making prints. Learn how to capture share-worthy photos of pets, food, kids, groups and yourself! This workshop finishes with a hands-on photo walk around the Bearden shopping district.